Pro Evolution Soccer vs. FIFA: A storied rivalry that has stood the test of time. Much like the Highlander, there can only be one. Though EA Sports’ outing has received the majority of the attention over the past few seasons, Konami has been quietly sneaking up on the competition, just waiting to pounce. 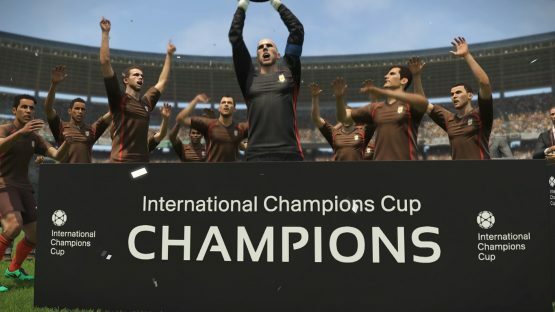 Each outing seems to get PES one step closer to besting the competition, but much like its name implies, you can only get so far through mere evolution. Is this the year that a perennial underdog finally returns to glory, atop the footie heap? A consistent strong point year-in and year-out has been the authenticity of PES’ on-field simulation and presentation. This revision continues that trend by essentially delivering a heavily spit-shined version of the previous iteration. The already stellar ball control mechanics continue to age like a fine wine and only improve with time. Enhanced realism plays into this as well, given that there’s been an increased emphasis on recreating the behaviors and tactics of real-life athletes. If you control a more physical player, look for them to bully their way up the field, using their imposing girth to shield the ball. As a counterpoint, the smaller, more agile players have new animations that oppose physicality with a keen ability to careen off of or slide through tight quarters when faced with slower resistance. Another aspect of the ball control mechanics worth mentioning is the continuous improvement to the ball handling in general. Utilizing the variety of different passing methods (not a new feature, but something that I have adored in prior releases) helps to set PES above the crowd. At least on the offensive side of the ball, if I were to lose the ball it would be instantly obvious what mistake I made and what could be done to avoid the same behavior in the future. The gameplay almost organically teaches the player to utilize all of the different styles of passing, which reinforces the perception of being in full control at all times. Too bad the offensive crispness couldn’t also be applied to the defensive side of the ball. Though it was previously the case, you never feel completely in control of the backfield at any given moment. This is further exacerbated by glitchy player switching, which tends to swap control to the player that is directly closest to the ball, regardless of whether they are actually in a position to make a play on the ball. Perhaps the algorithm should be tweaked to account for where the offensive player is going, in order to select the next player that would have adequate enough time to actually react and counter a run-in-progress. Hopefully this is something that can be updated via patch, because it’s currently tying my halfbacks in knots. While we are already nitpicking the usually outstanding on-field experience, I really have to mention something about some of the quirky AI behaviors. Especially in modes where you are dependent upon AIs to actually perform ball handling on their own, the results are mixed at best. Simple, common sense fundamentals of the sport were egregiously ignored. Concepts like keeping proper player spacing on the pitch proved to be surprisingly problematic. It wasn’t odd to see two players making a run up the sideline, only to have the support player suddenly veer into the path of the ball handler, forcing said player to dodge his own teammate. There were also scenarios where the opposing AI would get its brain scrambled by an incoming wave of defensive players. Oddly enough, this would sometimes result in the ball handler making erratic moments (maybe a series of abrupt backward jukes?) only to run out of bounds entirely. Granted, this wasn’t something happening every possession, but when an experience is otherwise so immaculately recreated, it occurred frequent enough for it to stick out like a sore toe. Next up, let’s take a moment to commiserate on the sorry state of the commentary. The shallow well of applicable quips is limited enough to inspire a deadly drinking game. For those pounding shots each time the “excessive traffic in the parking lot” or “leading by two goals is better than one” diatribe makes an appearance, ambulances are on standby. After a handful of matches every line of dialog will inspire a horrible sense of déjà vu, because you will have undoubtedly already heard it all ad nauseam. Easily the biggest thing that PES has against it this season is the loss of a huge portion of its licensed content. The absence of the Champions League and numerous clubs that were available only twelve months ago, seem further evidence of Konami’s lack of desire to spend any sort of money on franchises that won’t produce a pachinko machine or a sequel that rhymes with “Petal Pear Polid.” They tried at least tried to compensate by signing a handful of other secondary leagues and squads, but nothing is going to compensate for the huge gaping hole this has left in the roster. For all of the game’s shortcomings, the lack of true innovation looms large. While yes, there were certainly mechanical improvements made over the last 365 days, there were no new modes to get excited about. Considering the sad user interface when away from the field, cleaning up the terrible menu organization may have been a better use of the development team’s time. Hell, even making a player training tutorial for the career mode would have been a gigantic improvement. It genuinely took me three hours of playing before I realized there was a way to change your training point allocation, which is damn near inexcusable. 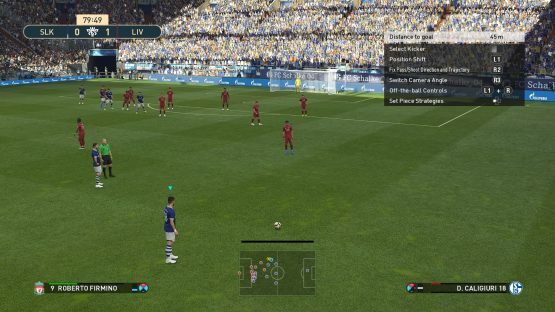 If you take a step back and look at the big picture, it’s hard to shake the feeling that Pro Evolution Soccer 2019 may actually be taking a step backwards this season. However, upon closer examination, a vast majority of the criticism consists of minor problems in an otherwise stellar football simulation. Unless the loss of Champions League is a deal breaker, at least on the pitch, this remains the premier choice for the discerning hooligan. Pro Evolution Soccer 2019 review code provided by publisher. Version 1.01.00 reviewed on a standard PlayStation 4. For more information on scoring please see our Review Policy here.